This was during a workshop on Blender given at a local video/media art center to a class of 4 people. 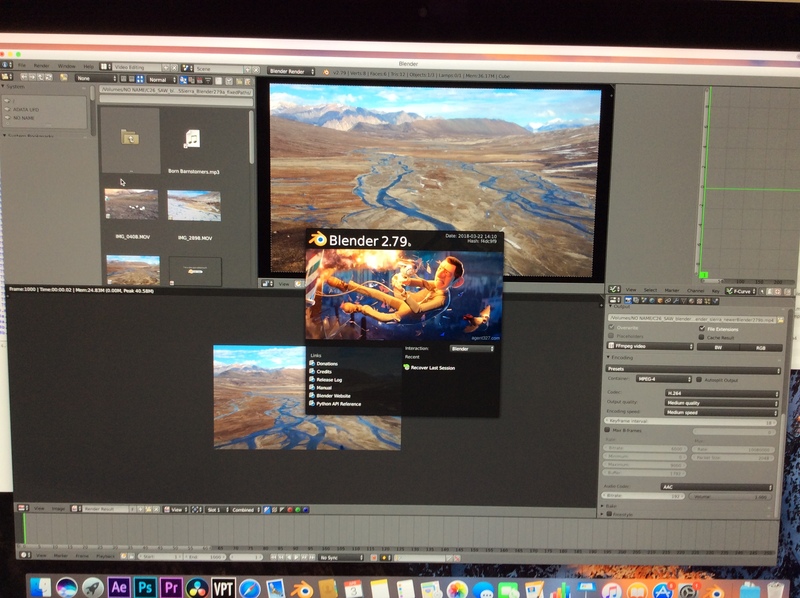 The center had just installed brand new Macs in the workshop room and had installed Blender 2.79a on each of them. None of the students were able to render their final videos, and I (the instructor) was not able to either. I had prepped the course at home on an MSI laptop running Windows 10 and Blender 2.79 and did not have any problems. One student brought their work home after the workshop and tried it on an older Mac OS X Leopard ver 10.8 and Blender 2.79 and was able to successfully render the exercises. Aaron Carlisle (Blendify) added a project: Platform: macOS. Aaron Carlisle (Blendify) added subscribers: Arto Kitula (akitula), Aaron Carlisle (Blendify). @Arto Kitula (akitula) can you take a look at this? Was the file packed or just like that? Making sure that asset file paths are ok, that rendered out on 2.79b. Debug output would be nice to trace the error, if it still is there. Is this question for me (probably not but answering just in case)? Sorry, I just dumped all the media files into the zip folder without maintaining the file/folder path structure. You will have to reset the paths. Also - I did not save the corrupt mpegs rendered from the course Macs, if that is what you are after. But I can go to the media/art center on Monday and regenerate them if needed. doesn't seem like the attached .blend is using any of the video files, (or i'm not bright enough to figure out how to reset the paths) if you could attach a .blend file where we just have to hit 'render animation' to get the problem to show that be appreciated. It should give some info. (paste terminal output here or upload the .txt file if it's big. I don't have permission to install anything on the machines at the media/art center, I just teach there sometimes. So I can't install 2.79b. But I can go in on Monday and try running it with the debug option on, then send you the output. And I can also send you a zip file with the correct paths (I just thought that was a straightforward thing for you guys to set in the Edit Strip options at the right of the strips panel in the Video Editing layout). Just so you know ... I am not a coder. I know a little bit, but not really enough to be helpful to you guys. Hi - the media/art center is closed today for Easter Monday, so I will have to go there tomorrow to generate the bug output. But I have attached a new zip folder containing the blend file with the correct paths to the various media used in the editing exercise. Note that I modified this blend file at home using Windows10/Blender2.79 today ... so you will still need to change the rendering options to FFmpeg if you test on MAC OS Sierra / Blender 2.79a. I also included a second blend file, if you want to just do a basic rendering test without any fancy editing (no cuts, no effect strips) ... all it is set for is a re-encoding from its original MOV format to an mp4 format at half HD (same codecs). If they let me, I will see if I can install other Blender versions on the MACs at the center tomorrow, to do some additional testing while I am generating the bug report(s). 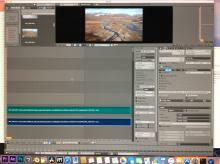 Today I tested a simple re-encoding of a 1000-frame section of an MOV file to a half-HD mp4 file using the Blender VSE on the Media/Art center Macs (which run Mac OS Sierra). I tested Blender versions 2.79, 2.79a and 2.79b ... all with the same result. 2 photos -- a) the VSE setup I used for 2.79a and b) the same setup for 2.79b but after rendering (so the strips panel has the rendered ooutput in it). 3 mp4s from the 3 different Blender versions ... in all cases, the rendered video starts fine, then the sound goes glitchy, and then the video freeze-frames and doesn't continue. 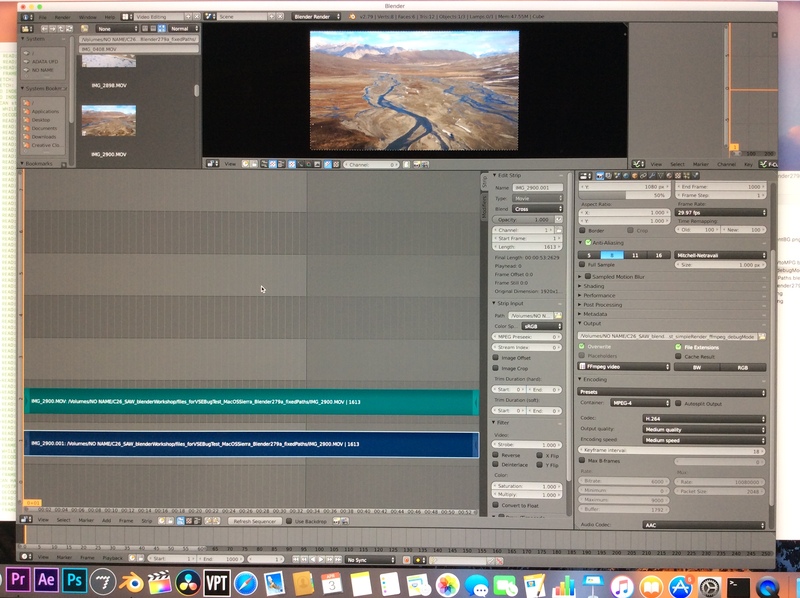 the blend file I created on the Macs for the above tests, and the MOV file I used as the video file to be converted to an mp4 using the ffmpeg option. Note ... One thing I am confused about ... Blender 2.79 on my PC at home does not have the ffmpeg option, it has the old menu (same as 2.69 on my old laptop). But Blender 2.79 for the Mac has the ffmpeg option ... is this a Mac thing? This comment was removed by Trudy Wohlleben (trudyvfx). And .... now that I am home, I just tried playing the rendered mp4s above on my pc and they play fine (so long as I don't use Quicktime). 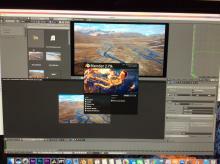 So it is not a Blender issue but a Quicktime playback issue on the macs at the center. I feel like an idiot for not having tried that before. That said ... when I render mp4s from Blender's VSE on my pc at home (v2.79) - they play fine on Quicktime both at home and at the Media/Art centre. So there might still be something weird about the encoding going on ? Don’t think there is any bug in Blender here then, video encoding is an art of its own, to get it working on all possible readers and platforms… Thanks for the report anyway.